Beat about 10 miles south of Skwentna on the Yentna River. 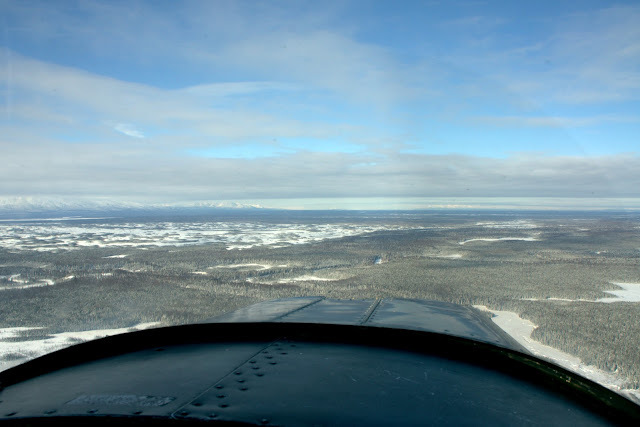 This afternoon, my friend Dan Bailey and I set out from Anchorage to fly over the Yentna River in his Cessna 120. Our goal: A bird's eye view of the Iditarod Trail Invitational. We knew most racers would be bunched up in the 32 miles between Yentna Station and Skwentna Roadhouse, and the wide Yentna River was a great place to spot the racers. We took off from Anchorage and flew over the Sustina Valley, spotting familiar landmarks such as Point McKenzie, the survey cut that serves as part of the Susitna 100 course, and Flathorn Lake. 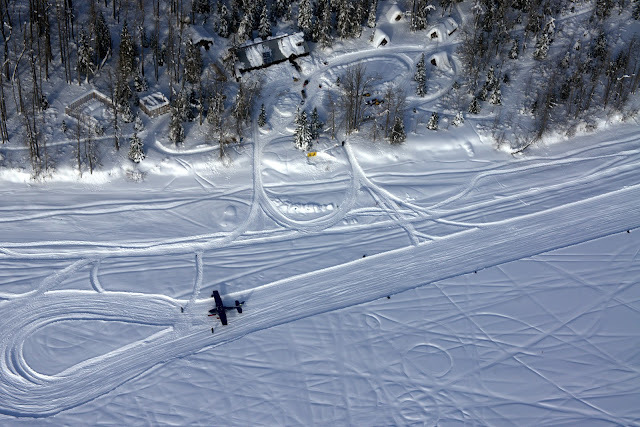 Even from 500 feet above the ground, the trail told a story of its own. The thin line across the Dismal Swamp was a mess of deep, staggered footprints. It looked like a herd of drunken moose had forged through the drifted snow. An aerial view of Luce's Lodge. This spot is always a welcome sight in the cold, lonely night. 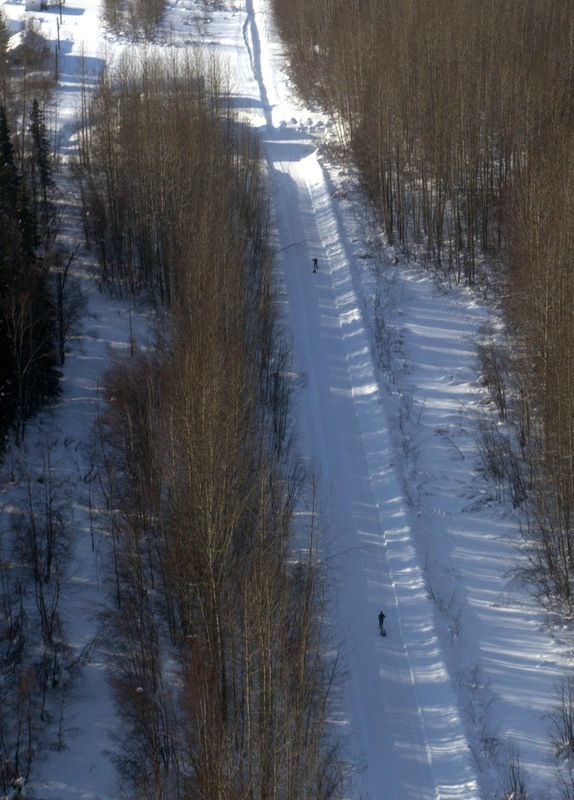 Yentna Station, the first checkpoint in the race at mile 57. Beat took about a six-hour rest here last night and left around 3:40 a.m. Based on that and his prior progress, I expected to see him some 20 miles farther up the river during our 2 p.m. flyover. I projected this well, as he appeared to be about 10 to 12 miles south of Skwentna (mile 90) when we spotted him. Two cyclists push their bikes along the river. A thin snowmobile track threaded through the deep snow, but it appeared to be too soft to ride. We could see footprints in the snow from 500 feet up — again, not a good sign. As we flew north, we occasionally spotted cyclists trying to mount and ride their bikes, but this swerving effort usually ceased before we passed. 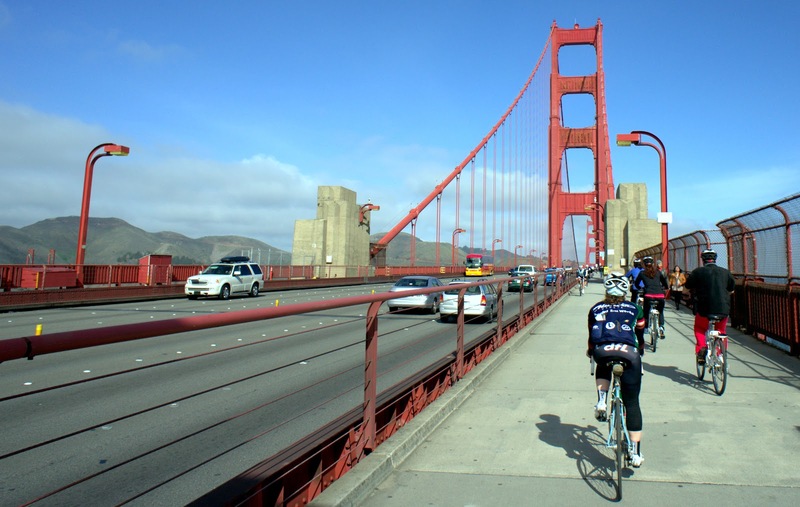 Most of the cyclists were pushing their bikes, still, seventy to eighty miles into the race. At least trail conditions were "pushable" today. From accounts I've heard, on Sunday and Monday conditions weren't even that good. The frontrunners broke trail through untouched snow, but even those behind them couldn't fare much better in their tracks. 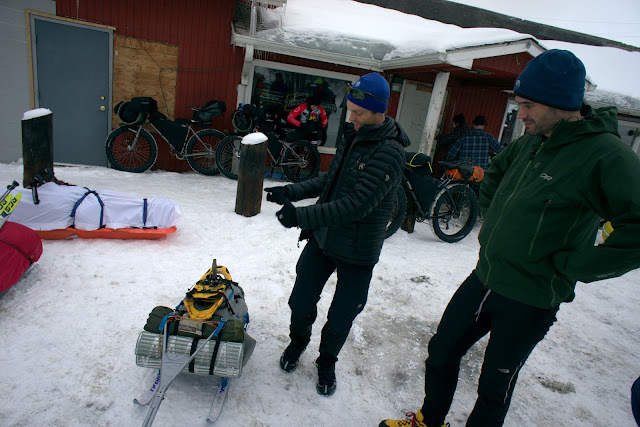 From the Susitna Flats to Yentna Station, I gathered, much of the course was a "bike carry" condition, meaning bikes couldn't just roll through the soft snow — they had to be hoisted and nudged. Such an effort is monstrous for anyone, but especially for smaller people (such as women) or racers with heavier bikes. I love a good slog as much as anyone, maybe more than anyone, but I don't blame the racers who dropped at Yentna Station. So far, this year's ITI has favored the mentally strong and also the physically strong (as in larger humans who can handle big loads.) This has not been a year for "fast" athletes, no matter their mode of travel. This photo gives a good overview of the trail — just a single track through the expansive river. Those who understand what a highway the Yentna River can become can see just how badly the weekend storm obliterated any signs of the old trail. And then, about a mile north of Fish Creek (where Beat, Anne and I stayed on the second night of our December trek) we spotted Beat! I was so excited. Dan buzzed low and I opened the window so I could stick my bare fingers into the 10-degree air with 90 mph wind chill and wave frantically at his hunched figure. Despite all the difficulties this year, I would so love to be out there right now. This is such an inexplicably intriguing adventure, and I'm so proud of him for persevering this far. I didn't receive any messages from him today. I expected the sat-phone contacts might taper off or even cease once Beat really started to get into trail mindset, a survival mode that blocks outside concerns as a coping mechanism. But that doesn't mean I won't fret about the lack of updates all the same. Ah, well. Dan and I had been planning to fly over and back, but he caught a glimpse of the Skwentna airstrip and realized it was clear enough to land his plane. We touched down and hiked into Skwentna Roadhouse to say hello and leave a message for Beat, as I already understood that he wouldn't arrive at the checkpoint before we had to leave to beat sunset back to Anchorage. 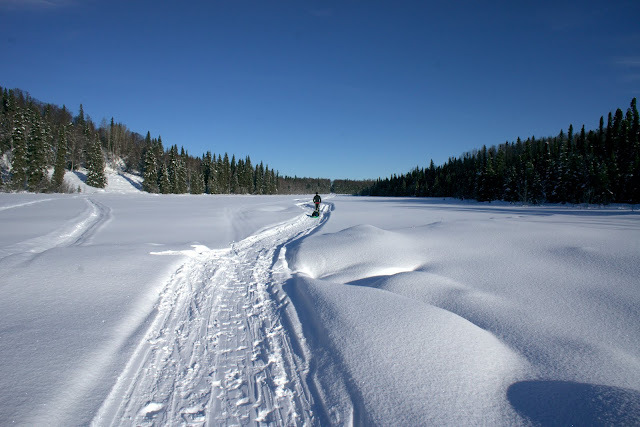 Unsurprisingly, Geoff had already made it into Skwentna, along with two skiers. The leader of the race, veteran Nome hiker Tim Hewitt, checked out fifteen minutes earlier. Geoff was in a fantastic mood, possibly because of that giant hamburger and fries, and had great trail stories to share about the first day. Apparently a group of sixteen bikers and hikers, led by cyclist Pete Basinger, worked together to essentially plow a trail through the waist-deep snow across the Dismal Swamp. They took turns breaking trail out front, although Pete did the lion's share because he was navigating. It took them four hours to cover less than three miles across the swamp. 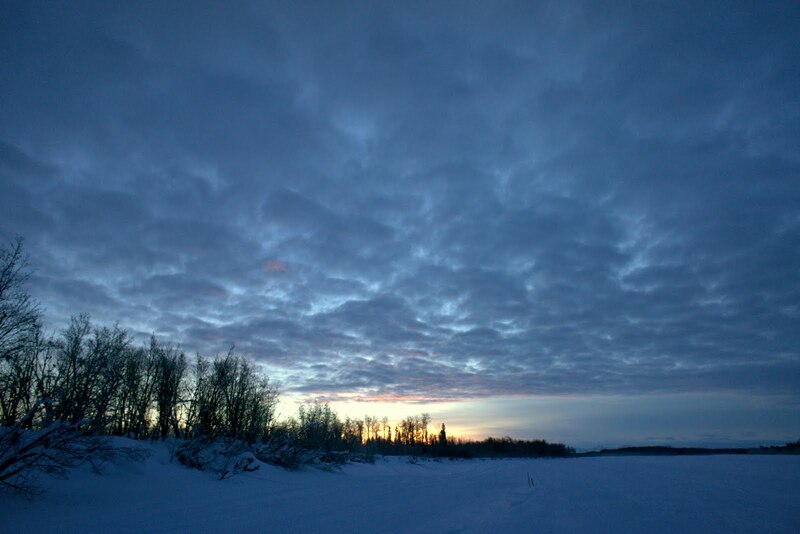 They split up to bivy on the banks of the Susitna River before continuing in the morning. 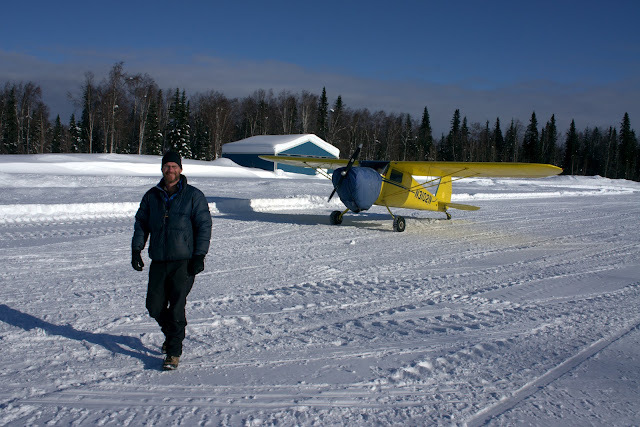 "I wouldn't stick around if I were you, there's going to be a lot of sadness here tonight," Geoff said, implying that the trail conditions on Tuesday were also quite tough (and confirming what we saw from the air), and others might be dispirited by the time they arrived at Skwentna. But Geoff was in great spirits, and that was fun to see. I was bummed I couldn't see Beat as well; I can only hope he doesn't feel sadness. Dan and I hiked back to the airport in what I viewed as awful trail but Geoff called this short Skwentna section "awesome — the best of the entire course." It gave me the smallest of tastes of what these incredibly tough sled-draggers and bike-pushers are going through out there. After a half mile of this I was drenched in sweat, and Dan's back hurt. As much as I love slogging, would I be able to slog through ninety miles of this and worse with no end in sight? That's a good question that I'm still asking myself. I'm not sure. But from trail reports we heard, it should get better. The valleys north of the Shell Hills received much less snow in the weekend storm, and the ITI trailbreakers have been working on the trails since it snowed. Geoff and one skier set out optimistically at about 3 p.m., and Dan and I prepared to leave for Anchorage. I left Beat a quick note telling him how proud I am of him, and to keep faith. Thank you, Dan, for the fantastic opportunity to view my favorite adventure race from the sky. "I can't do this," Beat's voice crackled across the satellite connection. "It's not possible." "It doesn't matter," I said. "Look what you've done already. You're amazing. All you need to do is get to Luce's Lodge. Get some rest, get some sleep. Sleep for a day if you want. All you have to do is get to Luce's." I hung up my cell phone and stared hatefully at the snow flurries floating outside my window. The Iditarod Trail was a relative breeze just one week ago when I traveled these same miles in the Susitna 100. Now it was buried in more than a foot of new, unconsolidated snow, and not a single machine had been through to break the trail. The runners were breaking the trail, at a pace of about 1.5 mph, and the bikers were still farther behind. They had covered only forty miles in 24 nearly non-stop hours. At that pace, Beat was right — it wasn't possible. Geoff and Beat analyze Geoff's Iditarod sled. 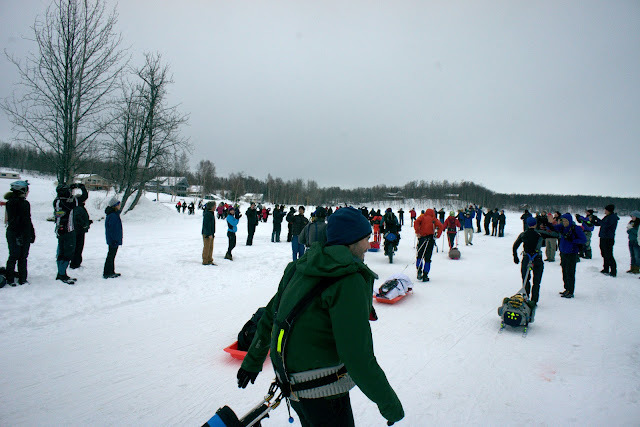 The race began so optimistically, under an overcast sky and 28 degrees on Knik Lake. Runners and bikers fluttered around and observed everyone else's gear. I spent much of the pre-race hour chatting with Geoff and Beat. One might think such a situation would be awkward, given I haven't seen Geoff since August 2010. But in the preoccupation of the moment, it was all an infectious mixture of anticipation and anxiety. At 2 p.m. Sunday, 47 racers embarked on their respective 350-mile or 1,000-mile journeys. The bikes took off toward the packed road and the runners formed a line across the lake toward the Iditarod Trail. We spectators waved and watched with admiration and, at least some of us, envy. I felt frustrated about how demoralized Beat was when he called me at 1 p.m. Monday, because there was nothing I could say to boost his spirits. I couldn't promise that snowmachine traffic would come to save him from the wallow, and I couldn't lie away the fact there was more snow in the forecast. 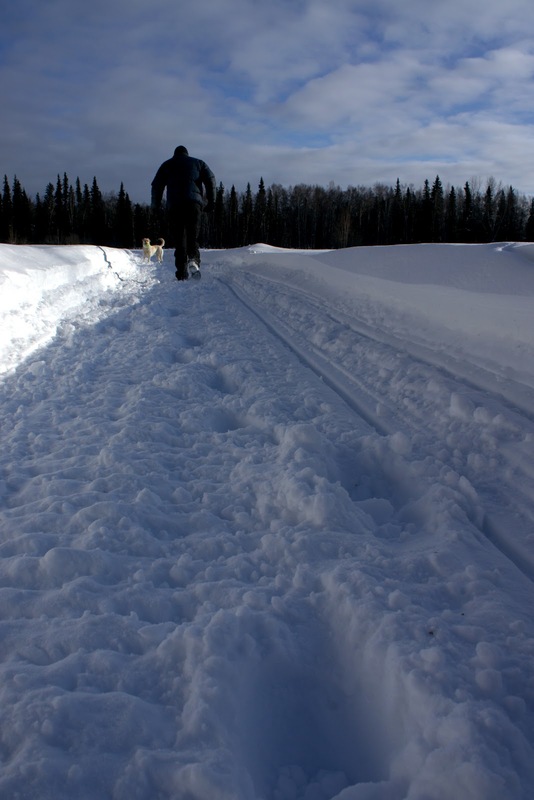 These aren't supposed to be the tough miles of the Iditarod; they're supposed to be the warm up. The tough miles of the Iditarod come later, over the mountains, across the deep-frozen Interior, into the unknown. I been holed up at a computer, waiting for news all morning. But I didn't want to dwell on my frustration. I packed up my gear and snowshoes and set out toward Lazy Mountain. Beat and David Johnston model their individual race fashion. Beat acquired the satellite phone one day before the race, mainly because he's a gear geek who can't resist a chance to use intriguing technology. I admitted that I'd love to hear from him during the race, but I certainly didn't expect it. I know how it can be out there. The outside world truly becomes another world. The first text came at 4:26 a.m. Monday: "bivy wall of death w/ anne, geoff, david and more. we're lead group breaking trail. overtook pete. Then "miss you, love you. not sure can be finished." 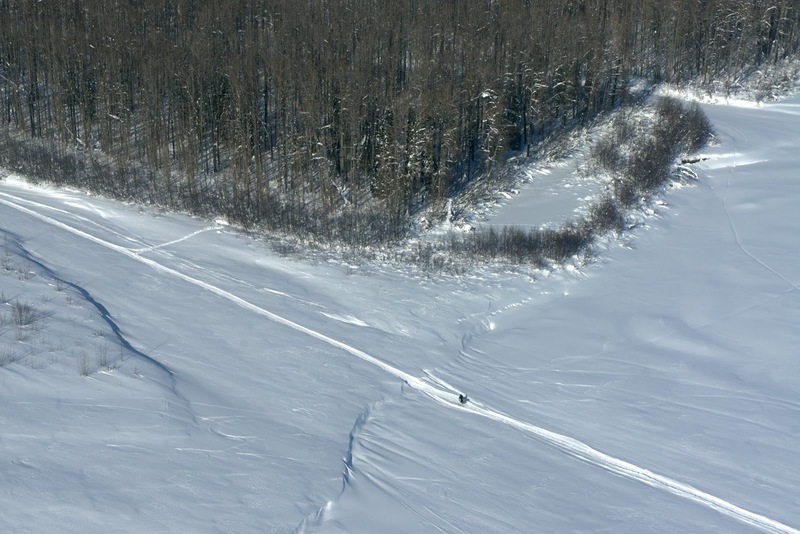 I received the first call just after 9 a.m. "I'm still on the Sustina River," Beat said, meaning he had traveled about thirty miles since 2 p.m. the day before with only about two hours rest. "We're taking turns breaking trail," Beat told me of the group of runners he was traveling with. "When I'm out front, I'm leading the race. All of the bikers are behind us now." I was floored by this news, because I slept through the text and had no idea trail conditions had gotten so bad. There was no trail. They might as well have been cutting a path across a remote wilderness, plodding through bottomless powder like turn-of-the-century polar explorers. The packed surface of the Lazy Mountain trail was so icy that every step forward in my snowshoes netted two skids back. I should have packed crampons. 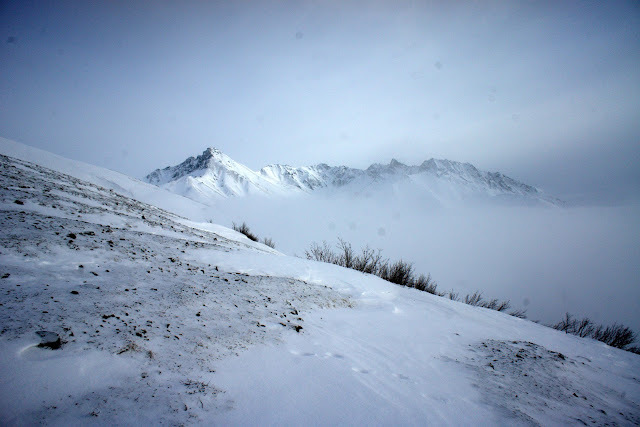 I stepped over into the deep powder beside the trail and began the slow plod up the steep slope. Every step was an ordeal; I sunk to my knees down to an icy base, so the footing was both slippery and strenuous. 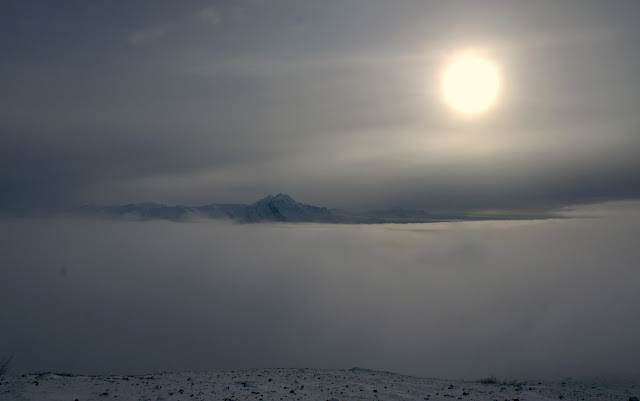 The low ceiling of clouds grew closer, and I knew that soon all I'd see were shapeless shades of gray. 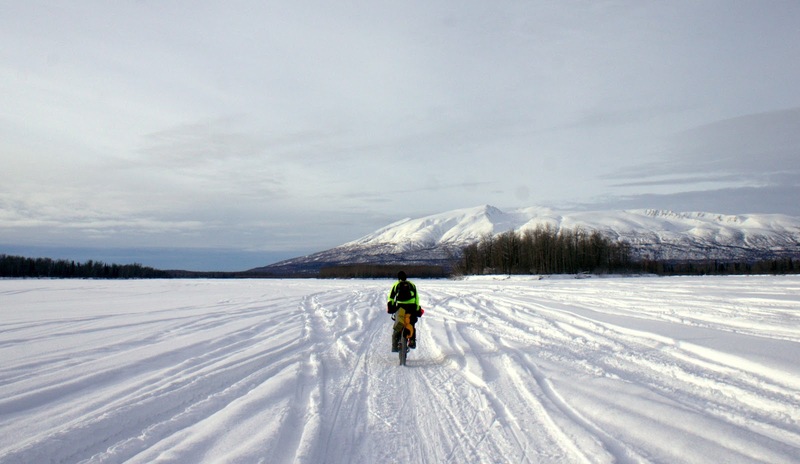 Out of the gate at Knik Lake. Beat sounded so discouraged when he called at 1 p.m. Progress was almost nonexistent; he estimated he had traveled six or seven miles in the four hours since we last spoke. He had been struggling with every ounce of strength for a standstill. The temperature was above freezing and he was wet, and growing cold. He had fallen behind the lead group because his sled wasn't performing well in the deep snow. It kept tipping over and dragging like a flat tire through the wet powder. "Who knew I'd wish I used a toboggan?" he said. I felt guilty because I too pushed for skis over a plastic sled. 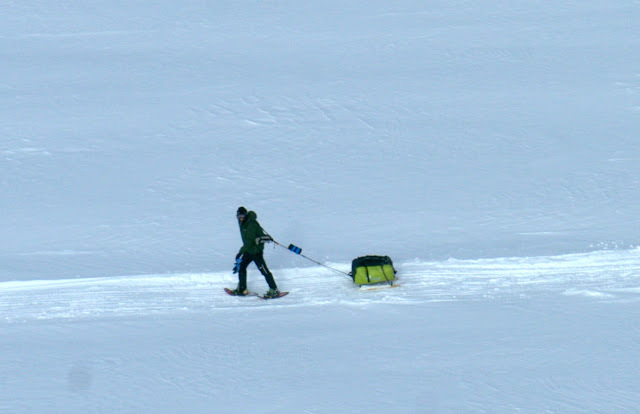 The sled performed flawlessly in the Sustina 100, but it wasn't designed for unconsolidated snow. "Just take it easy," I urged. "Go slow, take breaks. You have nothing to gain by pushing hard." "I have to push hard to to go forward," Beat said. "I don't have a choice." I couldn't help but sigh. "Yes, I know," I said. "I understand. I do understand." As the fog grew thicker, visibility decreased to a few bleak twigs among the snow. I was drenched in sweat despite wearing only a single layer, and my poles stabbed uselessly at the powder. I was beginning to resent my Lazy Mountain hike, but for my own reasons of coping with a situation I couldn't help, I felt obligated to keep at it. 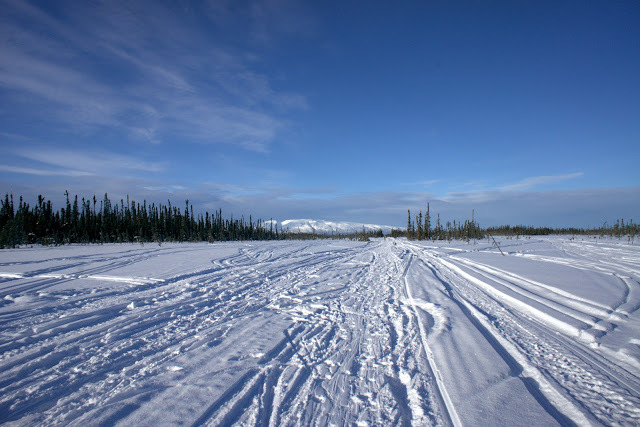 I was compelled to join the slog and show my solidarity for all 47 racers in the Iditarod Trail Invitational who had yet to even see the first checkpoint. Those who have never traveled long distances in bad snow conditions can't really understand how incredibly frustrating and difficult it is. It's the definition of futility, fighting a useless war with no end in sight. Climbing a mountain, well, that was easy. At least I had the top to look forward to. Beat only had the knowledge that there was no way he could maintain this level of effort, and no way he could finish the race at his current pace. He had no reason to believe that would change. I reached a wind-swept saddle and decided this would have to be the place I turned around. The snow was too crusty to register tracks, and I couldn't risk forging my own trail in light that was so disorientingly flat. 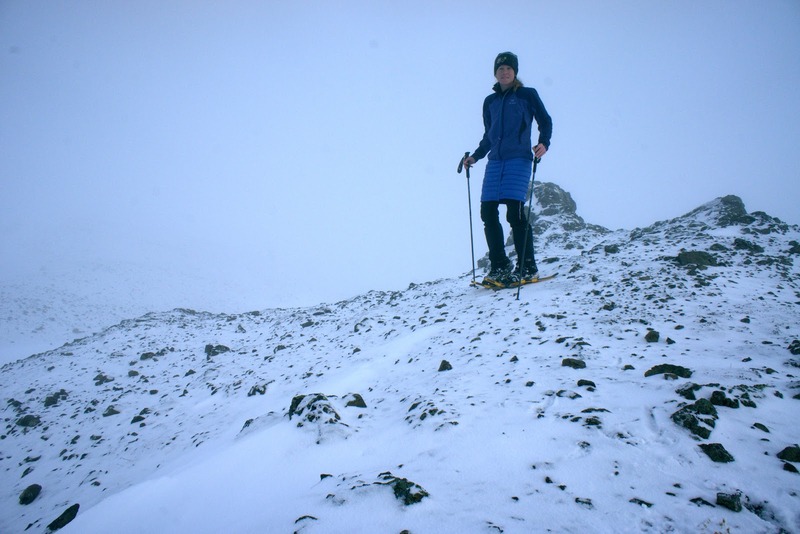 I was as likely to step off a cornice and plummet down a 70-degree slope as I was to follow the proper ridge. But as I stood at a rock outcropping shooting photos, I noticed the muted glare of the sun breaking through the clouds. When I looked up, I saw streaks of blue amid the gray. "Maybe I can get above this," I thought. As long as I could see rocks to help me gain my bearings, I decided it was worth a try. Facing the long path ahead. A 6:10 p.m. text brought a new injection of hope: "big meal at Luce's. now Yentna with Shawn. "Beat had not only made it to Luce's Lodge, he was planning to continue up the river. It didn't necessarily mean trailbreakers had put a track in place, or that the going was any easier, but at least he had enough optimism to head out the door. 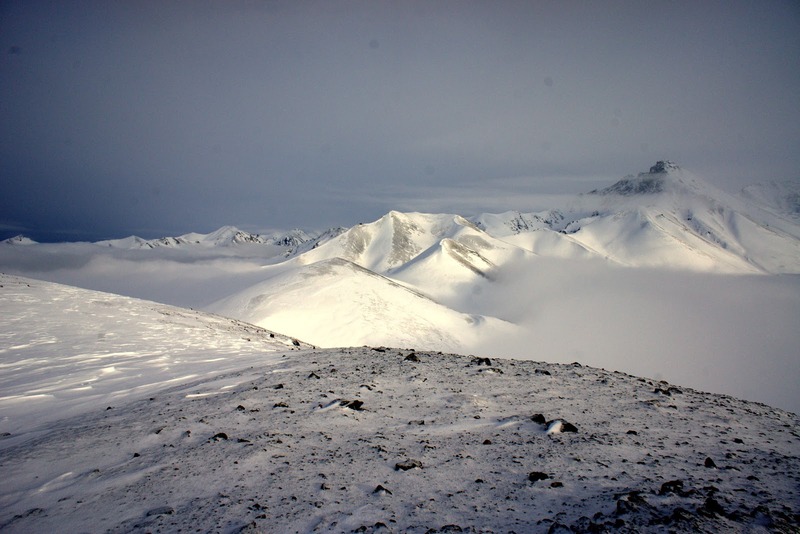 He planned to take a long rest at Yentna Station and set out toward Skwentna in the morning. Who knows what tomorrow will bring. Still, Beat is a master at taking things one step at a time — the bad steps and the good. 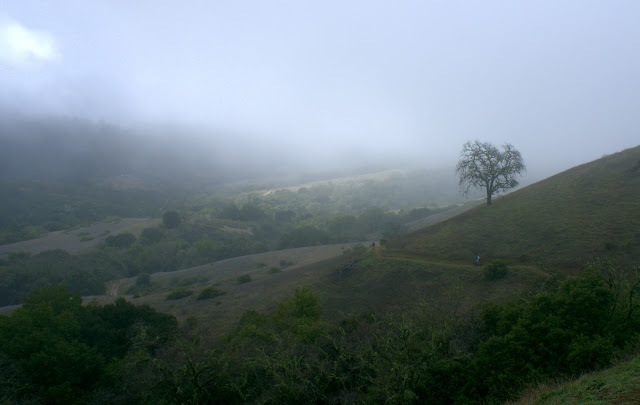 Sure enough, a few hundred feet more elevation carried me out of the clouds and into a clearing. At first I could only see hints of Matanuska Peak, and then it appeared in gold-tinted brilliance. Clouds continued to drift across the mountain and I climbed as hard as I could, determined to tag the peak before they closed in again. At the top at 3:45 p.m., I sent a quick text message to Beat's satellite phone: "On top of Lazy Mountain. Climbed above the clouds and found the sun. It is coming your way I can tell. You're amazing and I'm so proud of you." My first steps out of Luce's Lodge were excruciating. I had taken another 45-minute break, applied more Hydropel and dry pairs of liner and insulation socks, and allowed the vapor barrier to dry as I ate another grilled cheese sandwich. But the damage had been done. My soles were on fire, tingling and aching in a way that made each step feel like I was walking on hot coals. I gulped short, shallow breaths of the subzero air as I hobbled down the hill to my sled. Beat's one piece of advice for my consistently troubled feet cycled through my head: "Just remember, it always goes numb." But in those initial seconds out of the checkpoint, even walking required solemn concentration, the kind I imagine yogis employ when walking across hot coals. After packing up my sled, I managed to work through the hobble and resume a somewhat reluctant but consistent rhythm. I caught and passed Jane, which surprised me because I thought I was really starting to slow down at that point in the race. The first hints of dawn crept across the sky, casting violet light on the steep river bluffs. My peripheral vision caught the profile of a downhill skier in full tuck on a nearby slope. I turned and watched as the skier rocked back and forth as though awaiting a signal at a starting gate. This rocking continued until it occurred to me that there was no way the skier could possibly be real, but when I squinted, I still only saw a skier. It took at least five more minutes of forward motion before the shape of a tree began to replace to colorful skin suit and helmet I could have sworn I witnessed. As dawn grew brighter, I doubted Beat's assertions; my feet were not going numb. 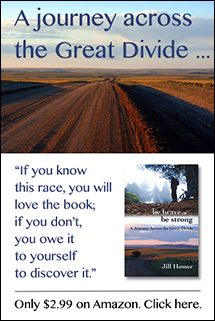 Out of sheer frustration, I quickened my stride and began running. And electric surge burst from my feet and injected a new kind of power into my legs. Running actually felt really good; all my tired walking muscles could finally rest as my running muscles kicked into gear. Again, I doubted I was actually moving any faster. My sled held me back and while my steps were more frequent, my stride was much shorter — a frantic sort of shuffle. But I convinced myself my speed had increased significantly. "If I can just run for a while, I'll make better time and I'll be off my feet sooner," I reasoned. I knew I'd need energy for running, so I reached into my pocket and cracked open the Sour Gummy Lifesavers, of which I only brought one bag specifically to serve as a treat. I plowed into the gummy candies with the same enthusiasm I'd felt for my food all day. In fact, I'd actually been rationing my supply since Luce's 1, just to ensure I showed up at Flathorn Lake 2 with at least 3,000 calories (and I started with over 8,000.) Plus, I ate two grilled cheese sandwiches and a cup of soup and a roll at the checkpoints. I was pretty proud about how well I'd been doing with my calorie intake. Sour gummies. I love them, love them, but when I am running, I can not handle them. My stomach withers under the bombardment of citric acid and quickly shuts down. I can no longer even count how many times sour gummies have turned on me during an endurance effort, and yet like an abused but loyal pet, I keep going back. I had downed about half of the five-ounce bag when I began to feel nauseated. Dizziness set in and I took a five minute break to await expected vomiting that never actually came. No choice but to resume walking as my stomach struggled to recover, during the first miles of the race in which I failed to take in any calories. Nearly twelve miles, actually, or four full hours. For other runners in this race, four hours without calories was nothing. But I already felt like I was skirting the edge of energy drain even while I was snarfing deep-space rocket fuel. My sugar levels crashed and I sputtered. Dizziness resumed but my stomach still warned me that any effort to take in anything would be severely punished. I crawled up the Wall of Death and stumbled into the Dismal Swamp with desperation gathering in beads of sweat on my bare forehead. It was not warm outside — still in the teens — but I felt like the air was hotter than California. I took off my jacket only to immediately catch the chill of the cold breeze wafting across the open swamp. It was so quickly frigid that I put my jacket back on, and soon felt too warm again. The Dismal Swamp appeared as a desert, barren and hot, and I felt like a lost hiker picking my way across an eternity of sand. It might as well have been an eternity; the oasis of boreal forest across the horizon never got any closer. My body no longer seemed capable of regulating temperature in anything but extremes, my blood was desperate for sugar and my stomach was nothing more than a cruel master, withholding relief. As blissed out as I had been on the overnight trek from Alexander Lake, by late Sunday morning I turned a complete 180 into a spiral of grump. I tried to hide my mood from the wonderful volunteers at Flathorn Lake, and made a struggling effort to stuff down the usually delicious jambalaya that they served me. I resumed my checkpoint sock routine and winced at the condition of my feet. The doughy skin looked so fragile that any rubbing movement threatened to remove multiple layers. (I remain convinced that were it not for the magic of Hydropel, I would probably not have any skin on the bottoms of my feet right now.) I used the excuse of "drying my feet" to burn up nearly an hour at Flathorn even though I had resolved to stick to twenty minutes. It didn't matter much at this point. "Fifteen more miles, just fifteen more miles," I consoled myself. When it comes to mileage, I still think in bike terms, where fifteen miles doesn't sound so bad. I couldn't conceptualize the reality of five hours of agony, so I didn't. "Just fifteen more miles." I'm not sure what exactly motivated those first steps along Flathorn Lake and back into the forest toward Point McKenzie. I was really reluctant to make them. 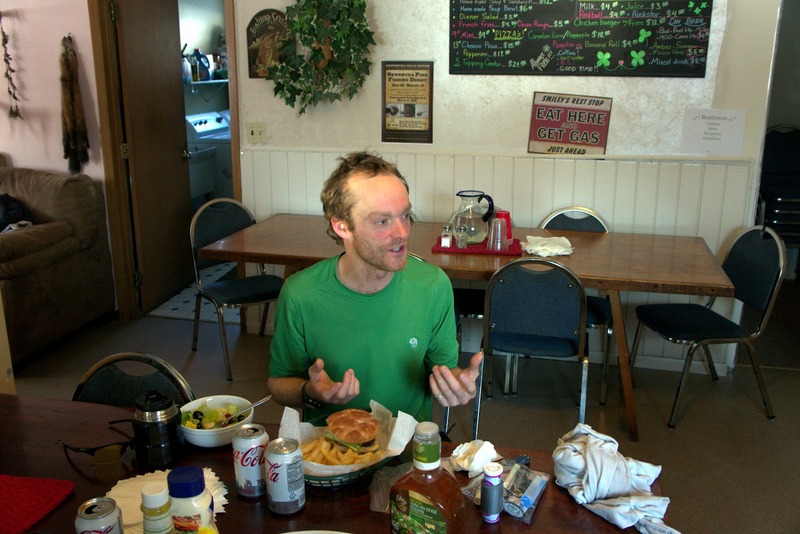 I grumbled that the popular ultrarunner mentality of finishing all races at all costs is really sort of dumb, and what's so great about a hundred miles anyway? I wasn't injured, so I wasn't about to ask for a ride on a snowmachine, but if there had been an exit road at any point, I was completely certain I was willing to bail, right there, less than fifteen miles from the finish. Would I actually have bailed? Probably not, but these are the things I grumble to myself when grumbling is all I have. I didn't realize that my foot pain was actually a bit of a blessing in disguise. As Beat promised, after a while it did go numb, only to be replaced by extreme sleepiness. The final leg of the course traversed a gas line that cut into the forest at a slight uphill slope in a perfectly straight line. The only reason I couldn't see the finish from twelve miles away was because the Earth is a sphere. What I could see were the Talkeetna Mountains, rendered flat beneath an overcast sky. The clouds ensured there was no change in the light all day long, so 10 a.m. looked like 1 p.m. looked like 4 p.m. There was no indication that time was passing, or that I was actually moving. Sleep took over as I walked. I did everything I could to keep myself awake. I turned off my iPod and sang, out loud, the lamest and most annoying songs I could think of. I slapped myself on the face and pinched my arm the way I do when I'm driving sleepy. I became terribly excited when I had to pee. I held it in as long as possible because that kept me awake, and relished in pulling to the side of the trail and doing my business because it was a chore, something different. I stopped a few times to purposelessly organize my sled. I weaved back and forth across the hundred-foot-wide gasline trail. I resumed eating Sour Gummy Lifesavers. Oh yes, I did do that. I put my head down and let time go by. Sometimes in racing, like in life, that's all you can do. It's not all Northern Lights and bliss, but somehow it's the tough challenges that make it all worth it. This is not about suffering so much as it is about overcoming suffering, which everyone must do in life, and it's empowering to understand the ways in which we can overcome it. Still, I felt fully defeated when, just two miles from the finish, I noticed a yellow light approach from behind and watched Jane run past. She was running. I mean, she was really running. Whether she was running to beat me or simply end her own agony faster I did not know, but I did not really care. Every time I had attempted to run in the past ten miles (because that, too, broke up the boredom) I nearly vomited. I was not ready or willing to participate in a two-mile sprint. Not only that, but the whole idea seemed so preposterous and egotistical after 35 hours of slogging that I couldn' t even entertain it. A man passed shortly after and implied a question as to whether or not I was going to chase Jane for second place. "She deserves it," I said. I felt so miserable. It's petty, but I resented being passed. This no longer bothers me at all, but my fragile mood at the time took it hard, and that did cast a sour pall over my finish. Jane did put in an awesome final sprint, finishing a full twelve minutes in front of me. Actually, two more guys passed me in those final minutes, the last of whom jogged by less than fifty meters from the finish. I joked that we should finish together for a tie, and he still blasted ahead. I walked (didn't even attempt the finish line shuffle) across the line at 8:42, for a finishing time of 35 hours and 42 minutes. I had actually achieved my best-case scenario goal of a sub-36-hour run. I collapsed into a bed at the rented cabin and fitfully but gratefully snoozed for several hours as I awaited Danni's finish. She came in after 41 hours (40:59 according to her watch.) We were both so overtired that Danni passed out mid-sentence and I nearly broke into tears when I became lost and drove in a few circles while trying to find our hotel in Wasilla. The satisfaction of finishing (and acknowledgement of my grotesquely swollen feet and heat blisters) wouldn't come until later. But the satisfaction was there, growing ever deeper as the pain subsided. That's what lingers in hundreds of happy memories, the meaning behind the madness. The first person I saw out of Luce's Lodge was a runner. I could see his white headlight bobbing up and down from a long distance up the river, and smiled at the realization that he was actually running. This made sense, as he was more than twenty miles in front of me. I did some quick math and realized he was on a sub-24-hour pace, moving with forceful speed — or at least as much speed as this soft trail would yield. 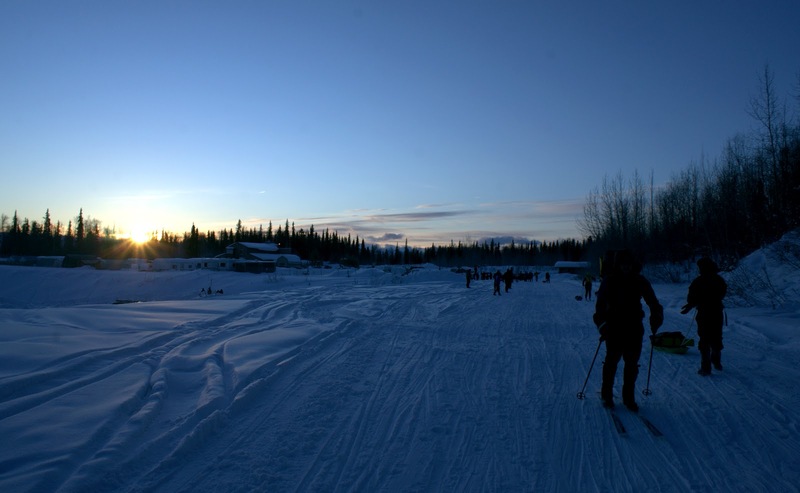 In all the years of the Susitna 100, 24 hours has only been broken by a few people. 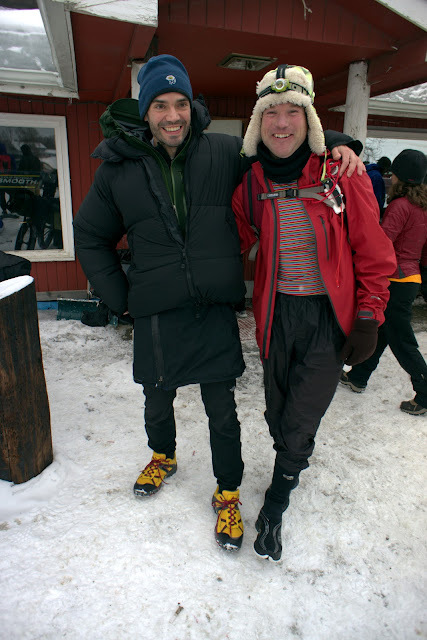 When we finally crossed paths more than five minutes later, I realized he was my friend, David Johnston. I raised my poles and waved my pogies around. "Yay, Dave!" Dave stopped running. "Is that you Jill?" "You're doing awesome!" he exclaimed. "I'm doing awesome? Holy cow, you're doing awesome," I said, feeling embarrassed that Dave was actually stopping to talk to me. "You should go, you're in first place!" Dave waved his arm. "Aw, I don't care. I just can't wait to get back to Luce's. I have a beer waiting for me there." "Sounds, um, relaxing," I laughed. "Hey, thanks for stopping to chat. I enjoy passing everyone like this on this course." "My favorite part is seeing everyone," he said with his characteristic grin. "The rest just hurts bad with many mental sacrifices." I laughed again and waved as he continued running. I admit I enjoy being involved in sports that are still small and quirky enough that even the race leaders still stop to chat and guzzle beers. 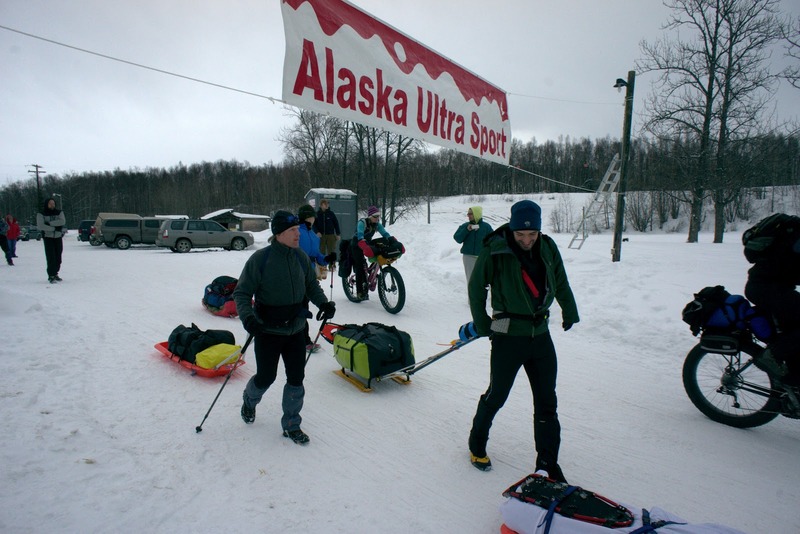 Not that there's no competition in the Susitna 100. Dave still had Joe Grant hot on his trail, and would have to continue to make mental sacrifices all the way to his 24:11 finish. Boosted by more friendly faces, I made good time to Alexander Lake, the turnaround point and mile 53 of the race. The bottoms of my feet had been simultaneously aching and burning, so I pulled off my socks to do another foot check. The skin looked like it belonged to a dead person — ghastly white and wrinkled deep into my foot. There was a patch of gray on both heels. Trench foot. I couldn't decide how to proceed. I had only one more pair of dry liner socks that I was going to save for my second Luce's stop. If I removed my insulation socks, my feet were going to slide around in the size ten shoes and probably blister badly in the process. And if I removed my vapor barrier, I was going to expose my soaking wet feet to the cold — now 13 degrees and rapidly dropping beneath the clearing sky. I slathered on more Hydropel and ate my soup slowly in hopes my liner socks would dry some. I checked out of Alexander Lake at 1:38 a.m., about ten minutes after another woman foot racer, Jane. I still wanted to travel by myself, but I felt better about being in the proximity of another person, now that there were fewer people to encounter on the inbound trip. As much as I relish in my chances for solitude, I still value the presence of other people — which is one of the reasons I enjoy racing. And because the Susitna 100 was a race, I admit I realized that Jane and I were in second and third position at that point, and I didn't have to concede second just yet. 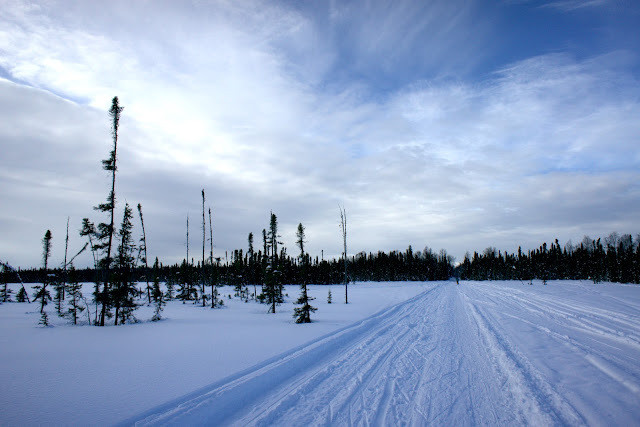 Jane's red blinking light provided a navigation point as I traced the trail back across a series of frozen swamps. 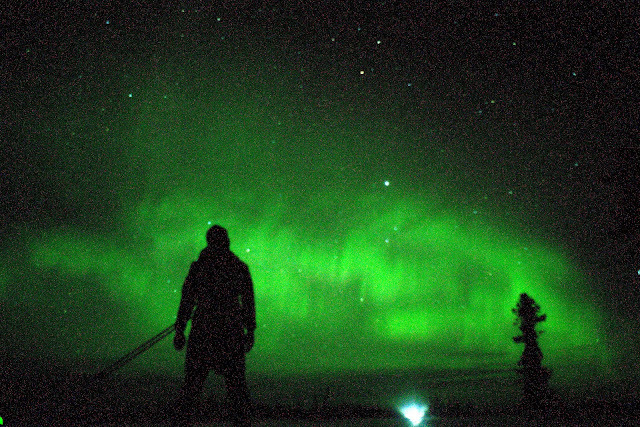 At the first long straightaway, I turned off my headlamp and caught my first glimpse of the aurora borealis. As my eyes adjusted, the soft white blur sharpened into a masterpiece of light, tinged with streaks of green and magenta. I shed a few tears at the overwhelming beauty before I became lost in it. Time seemed to stop, and Earth stood still as the lights pulled me inward. I was mesmerized, listening to the distant echo of my own footsteps as my mind freely danced with the sky. The Northern Lights are so much more dynamic than their depictions in photos and films. Columns and shapes pulsed and expanded like rapid brush strokes, painting multi-dimensional images that instantaneously blended into new brush strokes. The transition was so seamless that it almost appeared static, until suddenly the circle I had been watching became an arch, and then a elliptical stream stretched across the star-speckled sky. I believed I could see the universe expanding in front of me, as though a thousand light years were passing in the space of a thousand footsteps. I had never experienced Northern Lights with such encompassing depth, and it occurred to me that the fact my body was so exhausted helped open my mind to the surreal intensity of it all. There was also the simple fact that the whole reason I was out here at all, fifty miles from the nearest road at 2 a.m., was because I had crazy hobbies like the Susitna 100. I smiled at the sheer providence of finding myself in the right place at the right time, which often seems to be the place I find myself whenever I leave the confines of my comfort zone. In an seeming instant, I was back at Luce's Lodge. I had walked most of twelve miles with my headlamp off and neck craned toward the sky, only occasionally switching on the yellow light to gain my bearings, or trace out the trail once I lost Jane's blinking red beacon after stopping too long to take photos. It was a truly special experience that I can scarcely piece together now, and any descriptions I write appear rather weak. But I'm beyond thankful I was there to witness it — slow enough to be there, fit enough to be there, crazy enough to be there. Released from my aurora trance, I returned to a world where my feet hurt and the rest of me was becoming increasingly tired. I crossed paths with Danni about two miles after I left Alexander Lake, and figured there was a chance she might catch me, but I should probably count on spending the rest of the race alone. I also noticed my wet toes were beginning to feel pangs of cold. I checked my thermometer and saw the temperature had dropped to five below. A thin fog had settled over the river, masking the remnants of the aurora. It was 6 a.m., and I still had 35 more miles in front of me. 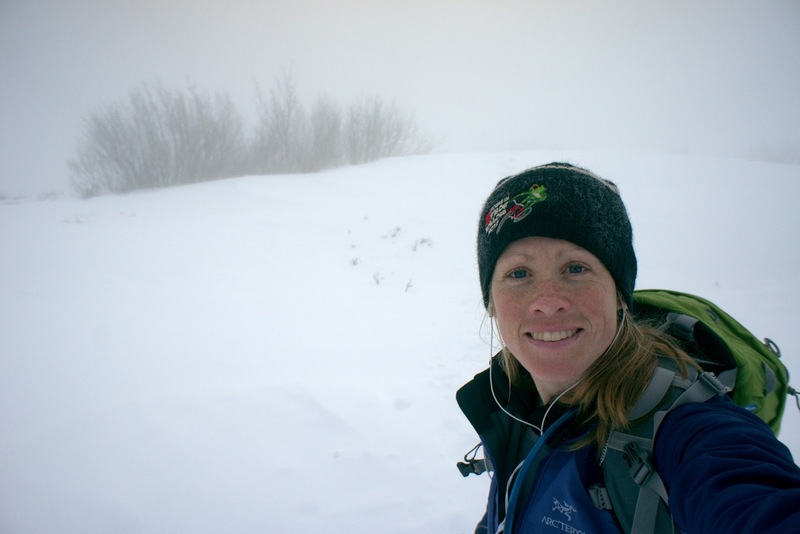 The week before the Susitna 100, Danni participated in a ski mountaineering race in British Columbia. When I commented on the intensity required in a race like that, Danni said, "It is a different challenge than just putting your head down and letting time go by." I considered her accurate summary of the Su100 as I shuffled through a thick layer of wind-swept powder across the Dismal Swamp. It wasn't all that long ago in human history that marching was a harsh necessity of war, or an outright punishment. What is it about modern life that has turned long marches into a hobby, even a pleasurable one? One might postulate that our first-world lives are simply too convenient and easy, while our biological makeup still thrives on physical labor and struggle. Since I consider myself more of an artist than an athlete, I suspect a desire to peel away the agglomeration of our modern lives in order to obtain a better view of our basic selves. I am never more basic than when I am alone in the wilderness, walking. In the irony of basic human nature, the tougher the situation I find myself in, the more emotionally fragile I become. By mile 27, I had been on the move for nearly eight hours. My hip muscles were already sore from the effort of pulling the sled. The arches of my feet ached and I often had to clench my toes to stretch the tendons. The day's cold had been mild but the sun was beginning to set, and I could feel wisps of chilled air across my skin. Danni and I left Flathorn Lake together but our comfortable paces were a little bit different, and I found myself ahead. 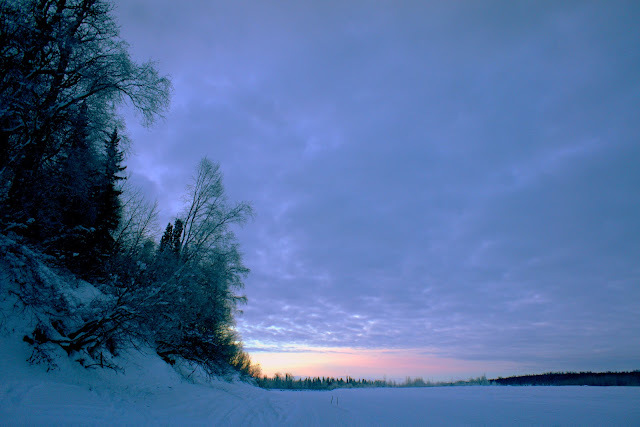 My first strike of loneliness hit as I wended through a narrow strip of forest beyond the swamp and reached the bank of the Susitna River. 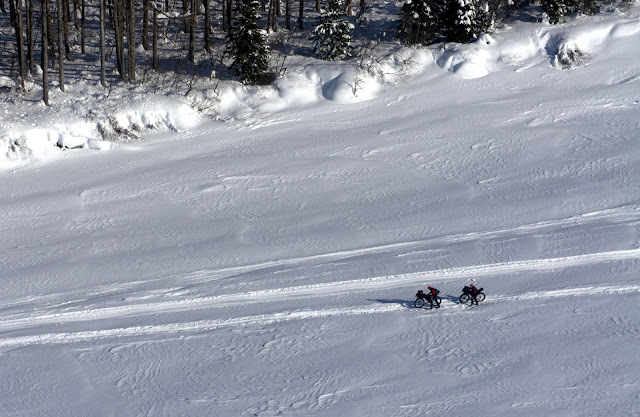 Race officials had placed a sign marking the "Wall of Death," a short but icy and steep headwall that often catches bikers and skiers unaware. For the marchers, it's just a hundred feet of trail in a hundred miles, almost not worth noting, but I paused at the top all the same. I was hit with a vivid memory of the minutes after my emotional meltdown in the 2011 Sustina 100. I crawled to the top of the Wall of Death and found Beat at the top with his sleeping pad laid out on the snow, and a spread of chocolate and other snacks on top. It was his peace offering after I had reamed him out for lecturing me about time cutoffs when I was feeling sick and demanded he leave me alone. One year later, the memory met me with a smile, and I wanted so much for Beat to be here with me so we could have our junk food picnic on top of the Wall of Death. Tears started to fall into my open grin, and I consoled myself with all of the mushy nonsense that the tough exterior of my non-basic self would usually squash. But no one was here to see me gush, so I gushed, relishing in the empowering acknowledgement of strong love. 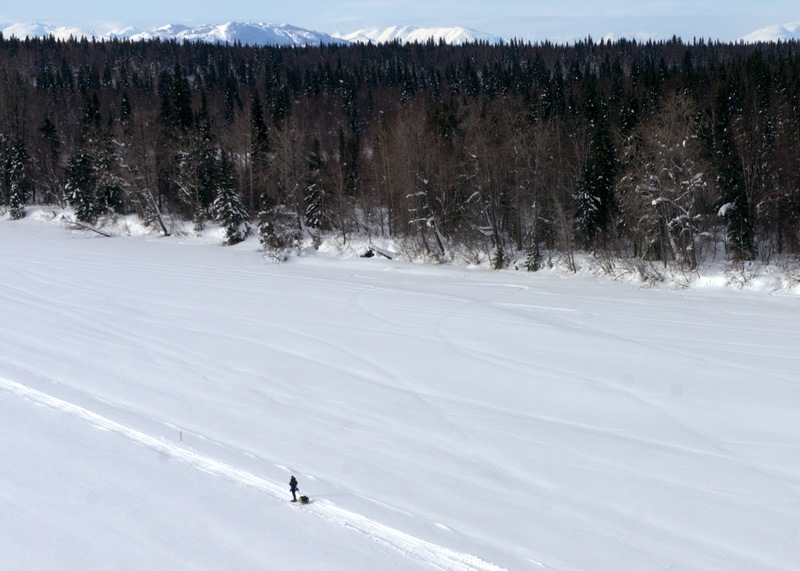 I dropped onto the Susitna River and started jogging, a snowshoe-laden shuffle that I doubted was any faster than my walking speed. But in that moment I was so filled with joy that I had to find some way to express it. I don't sing and I was much too anchored by snowshoes and a sled to dance, so I ran. The horizon greeted me with a fortress of mountains, drenched in the pink light of sunset. It was so simply beautiful that I started bawling all over again. Mountains! Snow! Alaska! My basic self needs little to be happy. I munched on deep-space rocket fuel and squinted at figures coming toward me from the distance. The lead bikers. I had been expecting them. The current out-and-back course of the Susitna 100 allows me to see nearly every other person in the race as they pass. As I was achieving mile thirty, the lead bikers were nearing mile eighty. They'd be done within three hours, before it was even late. I knew I had more than 24 hours in front of me, and laughed at the thought of what they must think of me and the other foot racers. I had an idea because I've been a cyclist in this race before. Even with my "skinny tire" mountain bike, I'd never been beaten by foot racer, even the course record holder (my ex-boyfriend, Geoff, who ran the Su100 in 2007 as his first 100-mile ultra in 21:43, a time I can not fathom.) Back then, I thought the foot racers were kind of quirky, to say the least. The former lollipop course meant I never even saw them. They were the ghosts of the Sustina 100, haunting the quiet hours long after most everyone else had finished and gone to bed. But perspectives shift, and now, five years later, I enjoyed being a ghost on the trail. The new out-and-back course makes it much less lonely. Once I turned onto the Yentna River, I could see a parade of white lights moving toward me, sparse but consistent all the way to Luce's Lodge. I reached the 41-mile checkpoint twelve hours and fifteen minutes after the start, at 9:15 p.m. As far as I could remember, that was at least an hour before the time I checked in to Luce's Lodge last year. I was already moving faster. Still, I vowed to keep my promise of minimal checkpoint time. I wanted to be at Luce's for a half hour at the most. I ordered a quick grilled cheese sandwich and ripped off my gators and multi-layered sock system for a liner sock change. Although I hadn't felt much pain while walking on the river, my feet looked like they were in bad shape. Some of my toenails were flaking, and I had several small blisters on my toes. The skin on my soles was white and deeply wrinkled, a symptom of being soaked in sweat for twelve hours. I had wondered if the outside temperature was too warm for my vapor barrier system, but I was so concerned about fending of frostbite that I figured, "feet can't be too warm." Apparently, they can. But at this point, my shoes were soaked from the snow, my insulation socks were soaked, and I had no choice but to stick with the vapor barrier or risk the combination of wet and cold. "Ah, how much worse can it get?" I thought. I still had 59 miles to go. After 55 miles, my steps had a sort of rhythm to them, a dance. I could see Jane's red taillight blinking several hundred meters directly across the frozen swamp, so I felt safe in turning off my own headlight. Cast away from that comfortable island of light, my eyes began to adjust to the delicate contrast of gray on black. All of my senses sharpened. I could taste the moist air — almost sweet, and cold ... zero degrees and dropping. I could feel the hot prickling on the pads of my feet that I had been trying so hard to ignore, so I clenched my toes and walked faster. The moonless night opened like a door in front of me, and my peripheral vision caught a flash of silver. 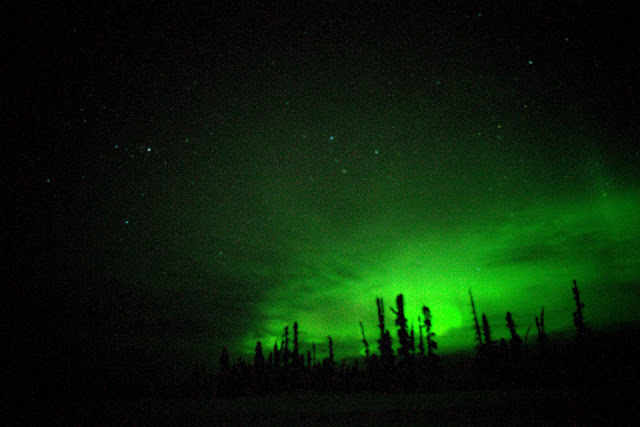 I glanced north and for the first time noticed columns of light rising from the boreal forest, high into an indigo sky. Tinged with subtle hints of green and magenta, light streaks rippled across the horizon and dissipated into a glowing arch. My exhausted mind conjured the image of a great symphony. Fingers of light extended from the arch like the bows of string instruments, glowing forms took the shape of flutes and trumpets, and colors rippled like sound waves — only the night was entirely silent. The only noise in this alien world was the rhythm of my steps, a lone dancer accompanied by an orchestra of light. I was dancing with the sky, moving in harmony with the aurora borealis, and the exhilaration of it all filled me with such a strong burst of emotions that my eyes filled with tears. I was crying, again. I had cried several times in this race. The first tears fell when I descended the "Wall of Death" where Beat made a picnic for me during last year's race; returning to that spot made me think about how much he meant to me. The second tears came as I climbed over an ice shelf on the Susitna River and glimpsed the pink light of the setting sun splashed across the mountains of the Alaska Range. 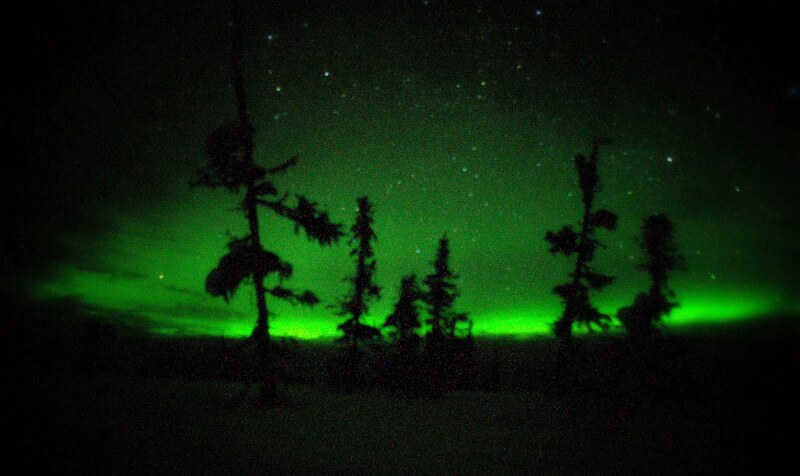 Now I was crying over the Northern Lights. Three times during the Sustina 100 I had reduced myself to a blubbering mess, and the race was only half over. And yet, I was halfway into this incredibly difficult hundred-mile foot expedition, and the only emotion that had gotten the better of me was extreme happiness. Instead of suffering and pain, beauty had become the one thing I could scarcely endure. Ever since I signed up for the 2012 Sustina 100, I had been grappling for a tangible reason for exactly why I wanted to go back and race this particular course on foot. I had taken on this challenge last year with Beat, and we finished together in 41:16. A part of me feels like I should try different things, visit different places. A larger part of me knows what a slog this race really is — that traveling on snow is similar to running a hundred miles up a moderately steep incline in terms of effort, and dragging a 25-pound sled nearly equals the difficulty of something entirely self-supported. When I picked the steepest 50K courses I could find in the Bay Area to train for the Susitna 100, I coud only lament that these training races weren't hard enough. 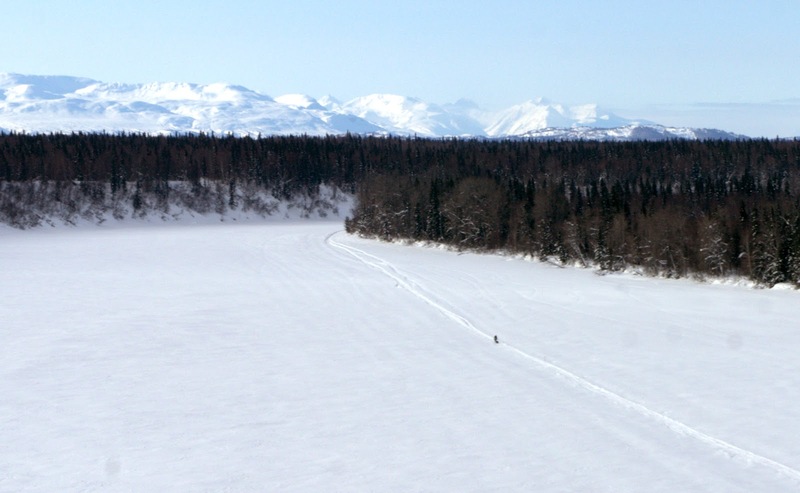 Completing the Susitna 100 on foot is really hard. I had this opinion at least partly validated when elite ultrarunner Joe Grant approached me after the race and admitted he had no idea what a slog the Sustina 100 would turn out to be. Joe finished in a smoking-fast 26 hours and 14 minutes. I can only imagine how fast runners might view this 100-mile time as disappointing. Still, I really wanted an excuse to return. 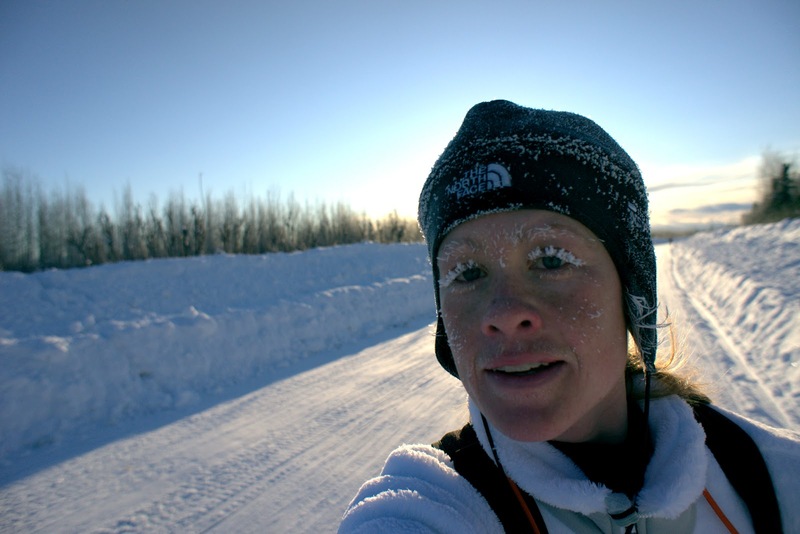 I was happy when my friend Danni admitted she also wanted to sign up for Susitna 100 again. I figured if Danni could go back, I could go back. Danni made it to mile 85 last year and wanted redemption this year. I guess the act of racing makes us all feel like we have something to prove, and I decided my 2012 goal would be a 36-hour finish. I didn't convey this goal to anyone, because it was an aggressive ambition for someone like me — fairly new to the sport, couldn't train specifically for the conditions, and planned to set out alone without any support from Beat this time. But I knew it was achievable in most trail conditions if I could stick to an infallible plan — average three miles per hour on the move and limit my checkpoint downtime to three hours. My secret plan involved snowshoes to make me impervious to changing trail conditions, and a determined walking pace that I could maintain indefinitely. I knew I needed to avoid the trap of running more than a couple hundred meters at a time, and even then just to shake out the walking muscles. Remember those old Looney Tunes episodes where one cartoon character holds onto the suspenders of another as the hapless victim unknowingly scrambles in place in a futile effort to get away? That is exactly what running on snow with a 25-pound sled feels like to me. It's a massive energy drain that nets frustratingly little gain in speed. Some runners can handle this energy drain. I, well, I wanted more happy moments than agony if I could manage it. Danni and I spent a relaxing night in a hotel on Lake Lucille in Wasilla, where we could see Sarah Palin's house (but strangely, we could not see Russia.) The weather in Southcentral Alaska had been warm — near or even above freezing — since we arrived, and Saturday morning in Wasilla was no different. I groaned as we fired up the rental car and the thermometer read 29 degrees. "It's going to be a massive slush fest," I grumbled. The softer snow becomes, the harder the trail makes us work. So you can imagine how Danni and I both squealed with audible delight as we made our way twenty miles west toward Point McKenzie and watched the thermometer plummet to six degrees, then two, then zero. In the strange phenomenon of Alaska weather, this isolated pocket of cold air was sitting exactly where it needed to be. This was a good omen, a good omen indeed. The race launched and I immediately broke my promise to myself by running, hard. The whole field was running and I didn't want to get caught way off the back, so I quickened my stride and sucked down single-digit air as my heart rate shot to the 170s. 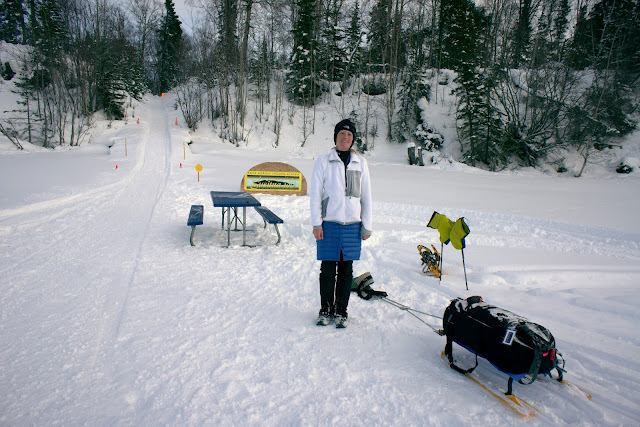 The snowshoes were still strapped to the back of my sled. My face was coated in frozen sweat but my smile was as wide as the expansive valley in front of me. It was a beautiful frosty morning, the sun was out, and I was running in Alaska. No matter that I had nearly exhausted the high burners with 96 miles in front of me. I wanted to run while it still felt good to run. Those early miles — after the endorphins settled in but before the toxins started to accumulate — were pure bliss. I relished in the simple movements that I knew were capable of carrying me a hundred miles across this land. The reclining profile of Mount Susitna loomed in a distance I knew I would have to not only close, but travel far beyond, and back. There was a certain satisfaction to the audacity — choosing a difficult place to go and the most difficult way of getting there. I no longer try to justify the ridiculousness of it all, only point out that this is the general direction of modern achievement. We still need to look inside ourselves and excavate the stuff we're made of, even if are the proverbial cartoon caracter with a hook attached to our suspenders. 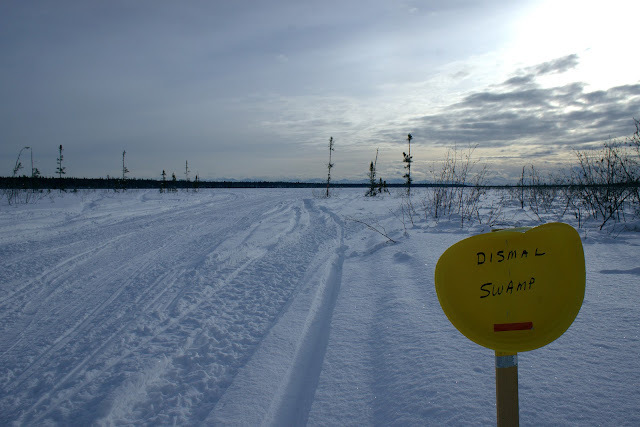 I've also compared the Susitna 100 to a nicotine patch for the little-known but crazy-potent Iditarod addiction. Like many who have been out there before, I yearn to return. The Su100 course on foot is beautiful and difficult enough to get my fix without venturing down the more dangerous and exhaustive rabbit hole of the longer stuff. I'm excited for Beat and his chance at the 350 miles to McGrath starting this coming Sunday, but I feel apprehensive as well. So much so that I spent some of the quiet hours of the Sustina 100 thinking about it. About three miles from the first checkpoint, I caught up to Danni. We had both run a fair number of those first miles in an effort to make the first cut-off, which in my opinion is unreasonably tight at seven hours for 22 miles that happen be the hilliest of the entire course. We had both stressed over making this cut-off, but arrived at Flathorn Lake by 2:45 p.m. with an hour and fifteen minutes to spare. The afternoon was becoming warm and we were both excited and feeling good. Of course, we had a long way to go, but our doubts were beginning to fade into the background. 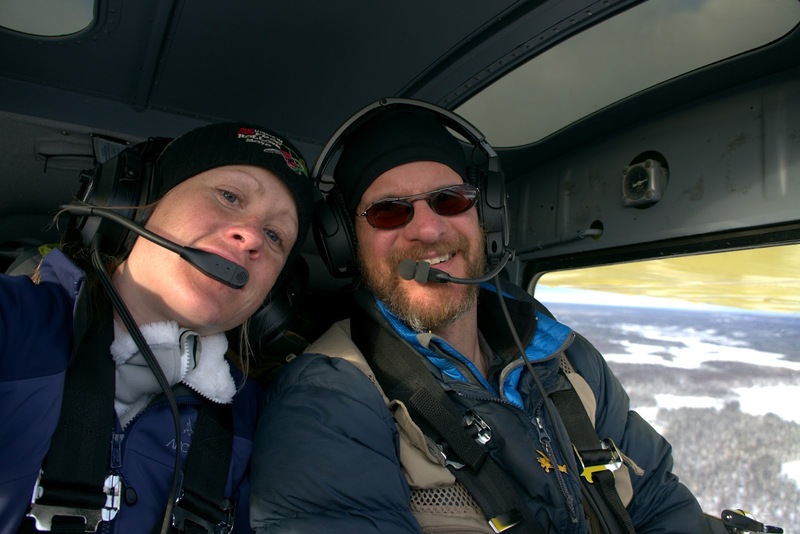 Yet another dynamic experience at the Susitna 100. I finished in 35:42, which was under my best-case scenario goal of 36 hours. I had one of the most incredible walks of my life during the 12-mile leg between the Alexander Lake turnaround and the Yentna River, marching under the aurora borealis with my headlamp off and watching columns of light ripple across the sky. I used snowshoes for 91 of the 100 miles. I ate most of the 5,000 calories of junk food that I brought and still experienced a harsh, energy-sapping bonk on the Dismal Swamp at mile 80. I was so paranoid about frostbite that I think I gave myself heat blisters from my vapor barrier sock system. I'll write a race report when I have more mental capabilities. 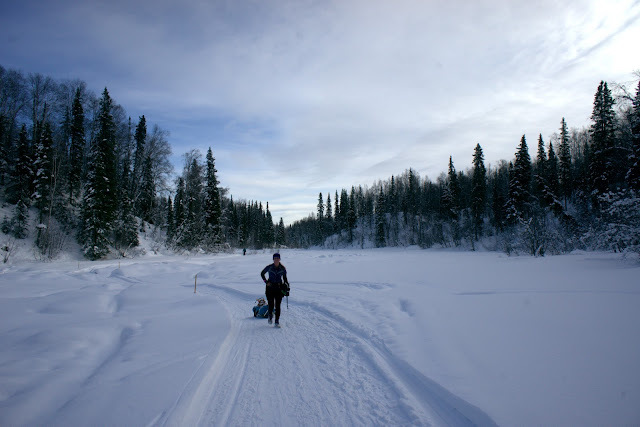 Right now I mainly fluctuate between thinking about food and sleep, and feeling a combination of horror and fascination about exactly what Beat is going to attempt next week in the Iditarod 350. My feet hurt just thinking about it. Actually, my feet just hurt. But I'm happy I did it. I love my annual slog-fest. More to come. 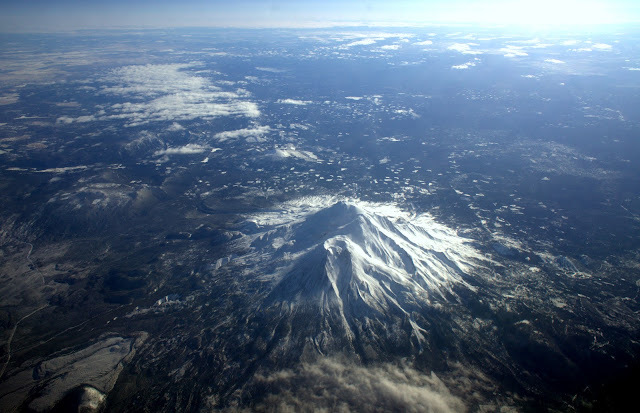 Mount Shasta from the plane. It was a beautiful day leaving San Jose. As I sat in the San Jose airport with a large cup of Peet's coffee, I looked over my gear list and tried to figure out what I'd forgotten or what I still needed to change. 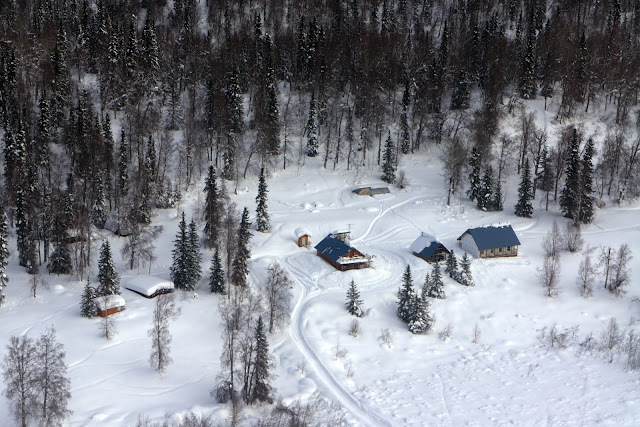 My mind drifted to the first time I'd done all this, while sitting on the hardwood floor of my cabin in Homer, Alaska, with a bewildering spread of unfamiliar gear piled around me. I smiled as I remembered strapping a handlebar bag full of Power Bars to the inside triangle of my full-suspension mountain bike, and laughed at the memory of bursting into tears while attempting to glue a pair of studded tires to the rims one day before the Susitna 100. That was six years ago, six years. Long enough that I can no longer define endurance racing as this quirky new hobby I'm experimenting with. No, this has become major part of my life, and I can no longer feign novice status when I stand at the starting line of my original journey. However, I am still a newbie to ultra distances on foot, and I will probably cling to this fact if things go wrong. My final food stash. One thing I've learned over the years is the importance — nay, necessity — of junk food. I've already blogged about appeasing my inner 4-year-old. But there are two truths that I think anyone who has ventured into the 24-hours-plus-of-activity zone has experienced. One: A person can not become malnourished in 24 hours no matter how badly they eat. Empty calories are still calories. Two: A body in continuous motion will reject food intake in the most surprising ways. I stick with what I know I can force down. 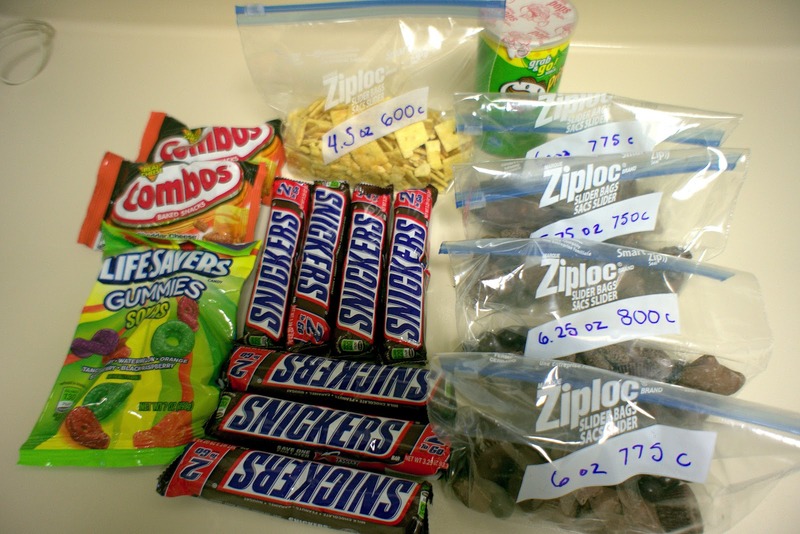 The Susitna 100 requires that all racers leave the last checkpoint with 3,000 "emergency" calories. That role is filled by the seven king-sized Snicker's Bars. The baggies contain my "deep space rocket fuel," a mixture of Trader Joe's chocolate-covered peanut butter pretzels, dark chocolate covered espresso beans, peanut butter cups, and dark chocolate and sea salt almonds. I weighed them mainly so I could tally my final food weight, and recorded the approximate calories in case I decide to swap them out with Snicker's Bars. The total is 5,205 consumable calories and 3,080 emergency calories. Together, the fuel stash weighs 4.2 pounds. This probably seems like a lot, especially with two or three supplement checkpoint meals. But I need to expect that I might be out there as long as 48 hours, and if I can actually consume 3,500+ calories during each 24-hour period, my performance (not to mention my mood) will be much better than if I languish on minimal rations. 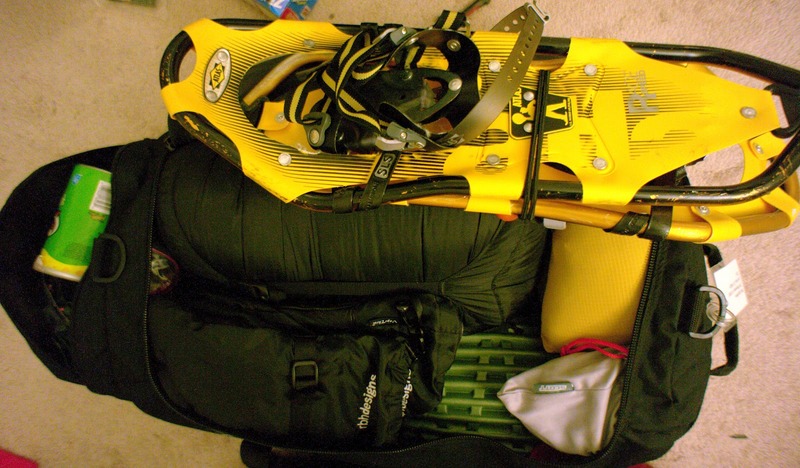 I packed up all my gear in my sled duffel bag. Including the snow shoes, the total is 21 pounds. This does not include water or the weight of the sled structure itself. What it does include is the 4.2 pounds of food, sled and foot repair kits, meds, toothbrush and toothpaste (oh yes. See above for justification), spare batteries, SPOT device, two headlamps, red blinkie, spare bladder, survival gear required by the race: (-40 degree Marmot Cwm sleeping bag, Thermarest Ridge Rest, Black Diamond winter bivy sack), RBH Designs Vapor Barrier mittens, goggles, Wiggy's waders (warm temperatures mean a potential for overflow), spare DryMax socks, spare fleece socks, spare base layer, hat, thin balaclava, fleece balaclava, mid-layer (won't be in sled if I start out the race wearing it) and a down coat. Because the race requires 15 pounds of gear at all times not including food, and I don't think the snowshoes will count as sled weight, I feel I've come close to the minimum even with the extra clothing — which I think is a good idea to carry. Given the weather forecasts for warmer temperatures, it will be more difficult to stay dry. As for clothing I plan to start with, if the forecasts hold true and temperatures are around +20 degrees, I will probably start the race wearing a pair of wind tights, a base layer, a bike jersey (for use of the pockets in back, where I will store things I want to keep warm), a Gortex coat, a thin balaclava and hat, and my same DryMax sock/ fleece sock/ vapor barrier sock/ Vasque Gortex shoes set-up. I will probably go bare-handed with pole pogies, and carry a set of liner mittens in my coat. 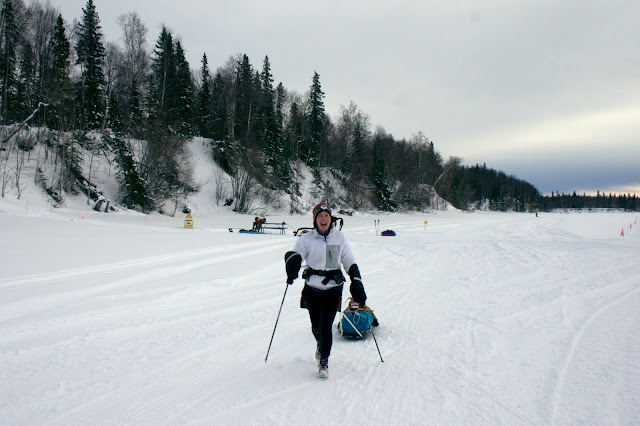 My race strategy is one of continuing forward motion and minimizing impact on my body, so I will likely make good use of my poles and snowshoes. I don't expect I'll spend much time "running," as I consider the motion too much of an energy drain for too little increase in speed when traveling on top of soft snow. I also need to acknowledge that I didn't train running in snow, and I have no idea what kind of impact the uneven footing will have on my body, but I do feel confident that I can walk consistently and comfortably at a decent clip. However, I will have to race the first checkpoint cut-off. Warmer temperatures and a sled full of tasty candy will likely reduce the allure of slumming at indoor checkpoints. Slushy conditions will significantly reduce everyone's pace, but hopefully things cool down a bit by race day. I'll probably post once again before the race starts on Saturday morning with a final pre-race update. But I wanted to make a gear post — if for no other reason, so I can check everything off when I complete my final packing on Friday. I should have a SPOT tracking page set up at http://www.beultra.com/routes/main_new.php?course=SU100Jill. Beat designed the page to include special slogging and sleeping icons if I am either moving very slow or have completely stopped. There's also an option to send pre-set messages, and if I have the wherewithal to do so, I will probably have some fun with that. For every ominous challenge looming over the horizon, there must inevitably be a quiet weekend before. The lists are complete with gear sorted. Travel plans have been made, transportation arranged, training tapered, and fitness as good as it's going to get. All that can happen now is injury, sickness, panic ... you get the picture. Daily routines must go on, distances must be traveled, and pre-race chaos must ensue. But, by and large, this is a week of waiting. I am not great at waiting. Rather than let phantom pains and panic get the best of me, I decided to stay busy this weekend. And because the Susitna 100 is all about mastering mind games, I also wanted to log some happy images in the short-term memory bank. Happy memories = biking with friends in scenic places. A four-hour mountain bike ride and a five-hour road ride didn't exactly fall into the smart taper plan, but I believe they were a good use of this weekend all the same. I was going to add warm weather to the happy memory bank, but Saturday was not exactly warm. We were off to a late start after Beat and Liehann spent more than an hour trying to fix Liehann's rear axle (they finally pronounced it busted, and Liehann had to ride Beat's mountain bike, which is why Beat rode the Fatback.) The boys raced each other up the mountain while I struggled to keep up, and then we were hammered by weather on the ridge. We descended Alpine in a spray of mud and cold wind, teeth chattering and fingers numb as we surfed the slick clay with locked-out rear wheels. 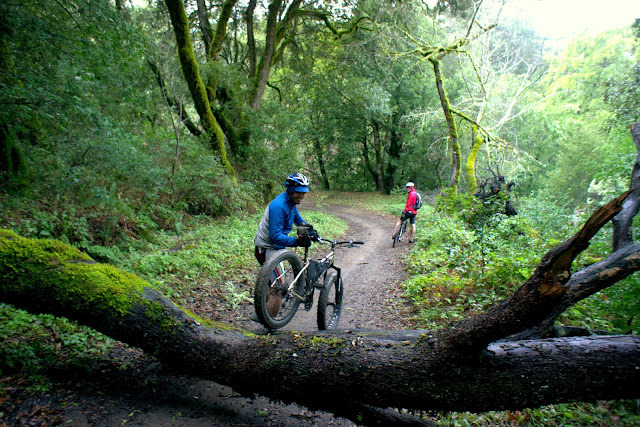 I fluctuated between a wide, mud-splattered grin, and quiet fretting about all the maladies I would surely catch from this ride — a cold, broken wrists from endoing in the mud, maybe pneumonia. Ah, phantom pains. 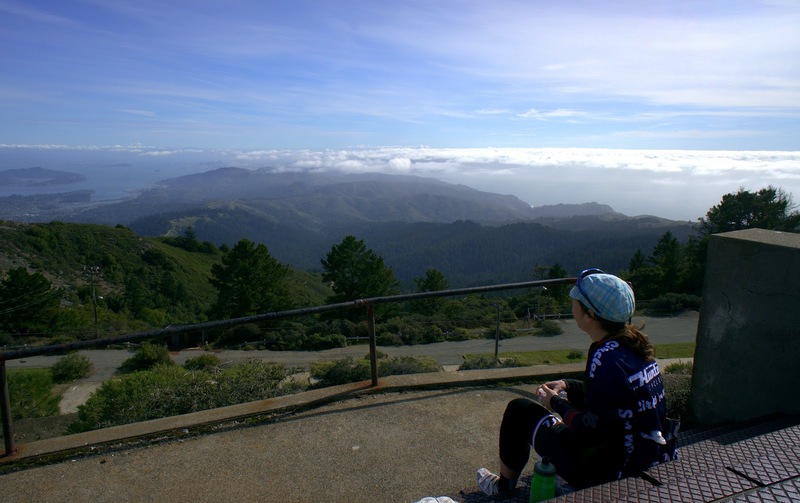 Today I met up with a new friend, Leah, for a "mellow" road ride through San Francisco and Marin County. Leah is a cross racer who is recovering after an intense season (cross season just ended a couple weeks ago in these parts.) And I'm tapering for a 100-mile foot race on snow. We both agreed we wanted to take it easy, but Leah secretly likes to hammer and I secretly like to ride all day. In some ways, we both got our secret wish, although the ride did maintain a mellow vibe. Leah guided me through the city and pointed out the sights while I stressed about dodging street cars, descending steep hills and clipping in and out and in and out of my road pedals. I am not well-practiced in urban riding. The Golden Gate Bridge and Sausalito bike path felt like a slalom through an obstacle course of pedestrians and meandering bikers. 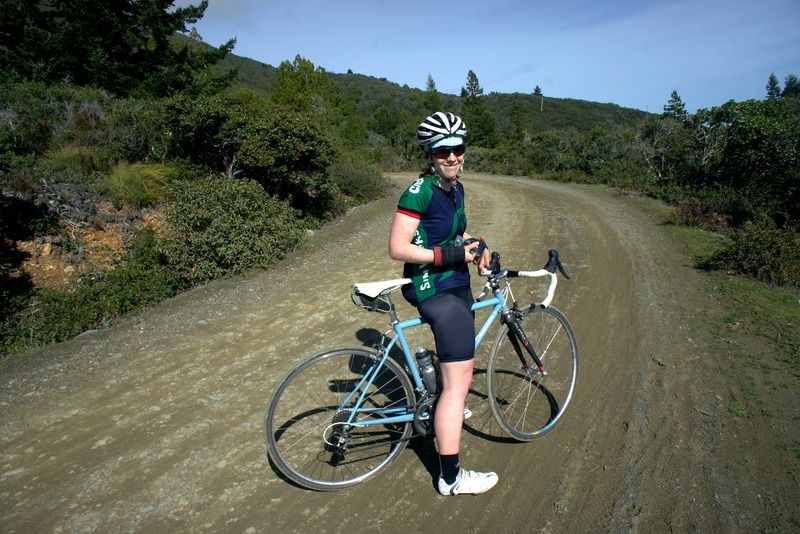 I think Leah could sense my weariness with crowds and suggested riding "some dirt" to connect with the road on Mount Tam. We were both riding road bikes. I had Beat's carbon S-Works, and I'm new enough to road biking that I'd hadn't ridden skinny tires on dirt, ever, so I was skeptical of this plan. "It's an easy fire road," Leah said. "We'll ride the dirt up and take the pavement down." I agreed before I remembered that Leah is a cross racer, and well-practiced in skinny-tire dirt riding. We ended up on Old Railroad Grade, a road that climbs most of the way from sea level to the 2,500-foot peak on soft dirt, rocks and loose gravel. 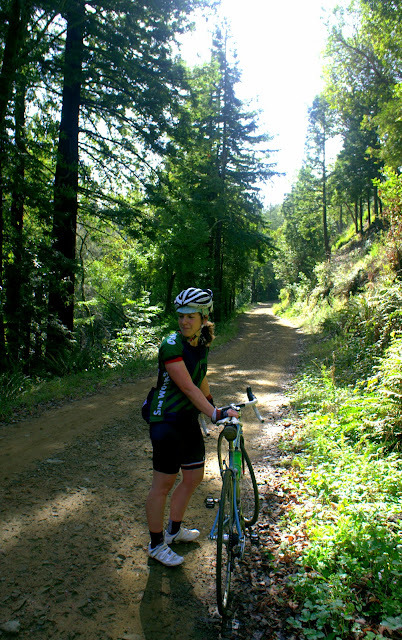 Although the grade made climbing easy, much of the surface was just as rugged as any other fire road I've ridden or run in the Bay Area, with stone slabs and deep ruts rippling through drainages. All I could do was put the fact I was riding an expensive road bike out of my mind, and this technique actually worked. It felt just like mountain biking, only bumpier. A few times we passed groups of mountain bikers who were clearly impressed ... "Whoa, nice bikes." Then, as we were rounding a tight hairpin turn on a particularly rugged rocky slab, two completely out-of-control mountain bikers came careening around the corner on our side of the road (it was a wide road, and we were all the way on the right edge.) Leah was in front and swerved first. I yanked my foot out of my pedal so fast that my ankle rebounded painfully into the crank, and I slammed my knee into the handlebar as I dove toward the bushes. That was the closest I have ever come to a head-on collision with another mountain biker — while riding a wide gravel road on a road bike. I was livid. All one of the guys could do was say "sorry" as he screamed past us. He was going too fast to stop. "What the hell!" I screamed back. Now I have bruises on my right ankle and left knee, and a grumpy disdain for mountain bikers who ride like idiots on easy trails (Seriously, guys, at least find a real downhill trail or a new hobby.) I only hope they didn't hit somebody else further down the road. 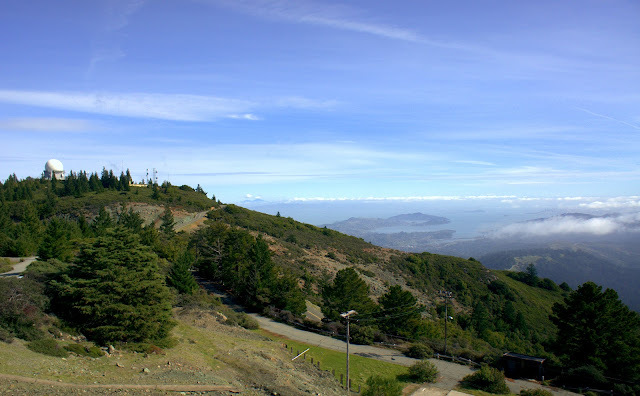 But all was forgotten when we reached the top of Mount Tam, hiked up to a dismantled military installation on the west peak, and looked out over the San Francisco Bay as a storm approached from the south. It was so peaceful up there, seemingly so far away from the noise and the crowds. I decided I loved the dynamics of our ride — busy urban streets to the tourist slalom to the fire road to this beautiful, tranquil perch above it all. As we descended a road cut into cliffs above the sea, I made a point to absorb as much speed as I could handle. Next weekend I'll likely be moving very slow when it's dark and cold, and it will be nice to remember what it feels like to fly above the open ocean, breathing air filled with the aroma of spring grass, sea salt and cherry blossoms, and descending into city drenched in golden light.